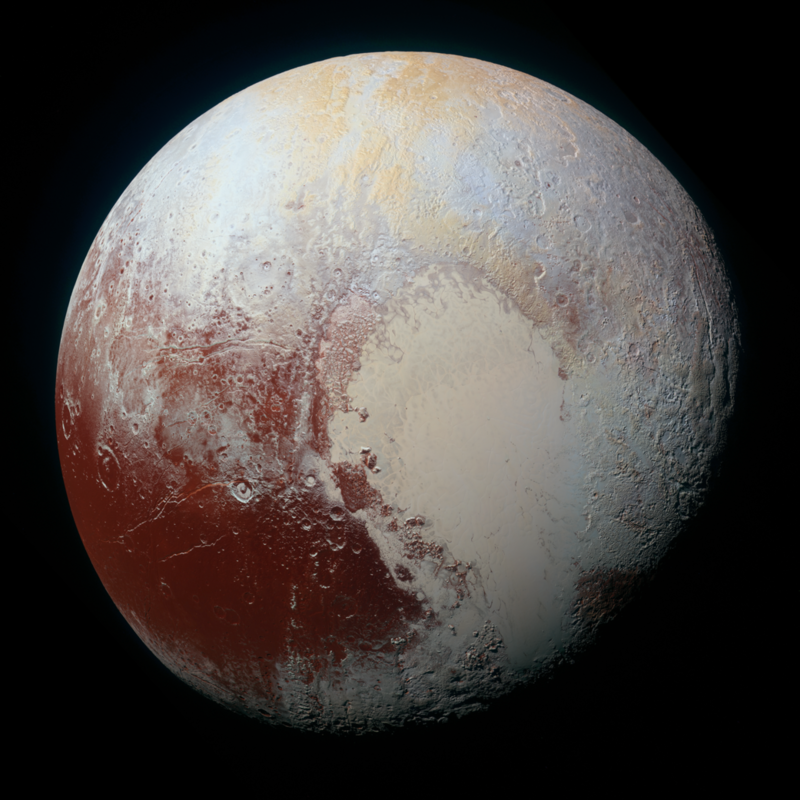 The 18th of February is dedicated to a special celestial body, which was discovered in 1930: Pluto. Named after the Roman god of the underworld, the once planet, and now dwarf planet, bequeathed its own name on to a prominent Disney character, the dog Pluto. This character was invented the same year that Clyde Tombaugh at the Lowell Observatory in Flagstaff, Arizona discovered our favorite dwarf planet. If you look closely, Pluto appears to have a a heart-shaped spot on its ‘belly’, which is probably the result of relatively young features that haven’t yet been hit by any small foreign objects. This heart was not immediately apparent in previous photos of Pluto, however the New Horizons fly-by provided us Earthlings with such an amazing array of up-close and detailed photos that the heart shape has somehow become a moniker of sorts for the dwarf planet. The dwarf planet is more than 5.8 billion kilometers away from our Sun, which is 40 AU or Earth to Sun distances. Pluto was once considered our solar system’s ninth and furthest planet. As a result of the distance from the Sun, this icy body requires a time significantly longer than the Earth to revolve around the Sun: 248 years. 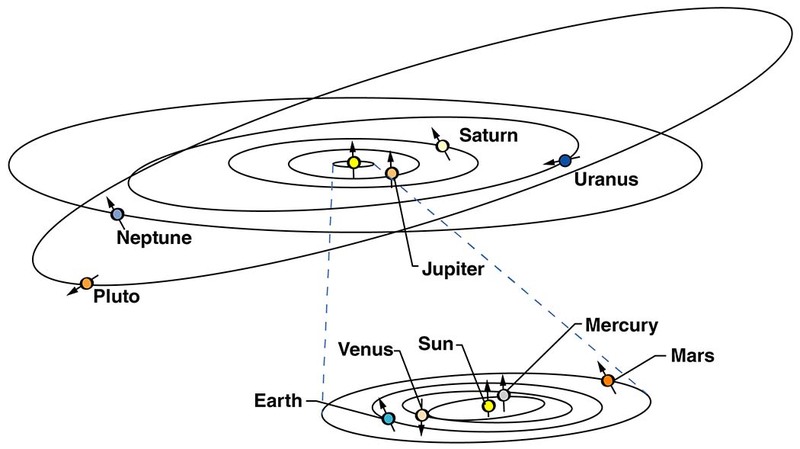 On top of that, the dwarf planet’s orbit around the Sun is far more ovular than that of the other planets and tilted significantly, while the Sun is interestingly not the absolute center of Pluto’s orbit. Pluto’s orbit is more ovular and significantly tilted compared to the other planets. Days on Pluto are significantly longer than on Earth, since one day lasts approximately 6.4 Earthling days. In terms of temperature, the difference is significant, with temperatures at -230°C (-380°F), making it less than hospitable to humans. This fact leads scientists to believe that Pluto is covered in ice, although recent reports have suggested that the dwarf planet could be home to ice volcanoes. In terms of gravity, the pull on Pluto is approximately 1/15 that of Earth. A person of 70 kilos (150 lbs) would weigh around 5 kilos (around 11 lbs). In the year 2006, Pluto’s status as a planet was downgraded to dwarf planet, leaving us with 8 known planets in our solar system. So, how did such a thing happen? Despite being furthest from the Sun, its demotion wasn’t a result of its position, rather the size of the body was the deciding factor, with many other potential ‘planets’ of similar size in the neighborhood. Pluto’s circumference is only 2,300 km (1,400 miles), making it smaller than our own Moon and ultimately leading to its demise as a planet. With the discovery of similarly sized objects as well as others larger than Pluto, scientists came to a difficult decision. However, the size was not the only deciding factor. An additional issue was the fact that Pluto’s orbit was not cleared of similar objects and others would often enter its orbit. For example, the Earth has a cleared orbit around the Sun and has more mass than all other objects together, existing in her vicinity. The story of Pluto’s demotion from planet to dwarf planet (officially 134340) still ruffles feathers. Pluto is, despite its dwarf status, still one with heart, and still in the hearts of many Earthlings.